The Cannon has been moved to a slightly different location on the corner of the High Street. An information board is to be installed beside a cannon on Stonehaven’s High Street, to give an insight into its significance. The historical artefact has been a permanent fixture on the High Street for as long as local people can remember and, according to some, used to mark the boundary between the Old Town and the New Town. Several concerned people contacted the Mearns Leader and Kincardineshire Observer this week, to report that the cannon had been moved, after Aberdeenshire Council completed significant flood protection work in the area, installing the Arbuthnott Drain. While it will not stop the area from flooding, the drain will provide a means for excess water to escape in the event of a flood. The work is part of wider measures to protect the community from the impacts of flooding and was approved in June by Aberdeenshire Council’s Policy and Resources committee, at an estimated cost of £235,000. One letter sent to this newspaper (see page 10), written on behalf of a group of local residents, asked for the cannon to be put back in its original position. 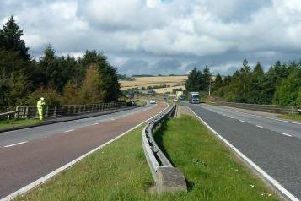 However, a representative from Aberdeenshire Council said that it had only been moved a short distance, less than two metres, and added that an information board is to be installed beside it. How significant do you think the cannon on the High Street is to Stonehaven? Let us know, get in touch by email at news@mearnsleader.com, phone us on our direct editorial number: (01569) 762859 or pop into our office at 12 Ann Street on Mondays and Tuesdays.